Over the past year, city planning and development have dominated Los Angeles’s civic discourse in a way not seen since Gail Goldberg was City Planning Director, with two recent ballot measures demonstrating voters’ demands for updating city priorities. The threat of Measure S mobilized City Hall to initiate reform of the development approval process widely perceived as broken, piecemeal, and relationship-driven. Immediately after the defeat of Measure S, Mayor Garcetti signed Executive Directive 19 to address planning and development reforms that focus on integrating housing affordability and transportation. To unpack this directive and pending Council action, LA City Planning Director Vince Bertoni joins TPR and discusses the new planning framework coming to City Hall. In conjunction with this month's TPR’s interview of Councilmember David Ryu, Bertoni articulates his vision for a new General Plan that integrates smart growth, mobility, and economic vitality in the growing city. The Planning Department has recently been the beneficiary of a great deal of attention from City Hall. Just days after the defeat of Measure S, Mayor Garcetti issued an executive order creating a task force on city planning, and an ordinance pending in City Council would mandate and fund the updating of community plans on a six-year recurring cycle. There’s also now a ban on ex-parte communications between planning commissioners and developers, new guidelines on transit-oriented development, revised oversight on environmental reports, and a reformed General Plan amendment process. Speak to how all this attention will impact your department going forward. Vince Bertoni: The City of LA, as an organization, currently has a real focus on the community plan program—a level at which I don’t know we’ve seen in a long time, if ever. The Planning Department was asked by Mayor Garcetti and the city council to come up with a plan to update the community plans as quickly as possible. At first, we came up with a scenario to complete all 35 plans within 10 years. The mayor and city council came back to us and said, “Can you shrink that to six years?” And we have now done just that. We’ll have to spend some time staffing up and getting other consulting resources onboard. We believe that we will be fully ramped up in 2018, and have the plans updated by 2024. The Planning Department will also be taking a leading role with the Mayoral Task Force on planning, the Transit-Oriented Communities Incentives, the revised environmental impact reports, and the General Plan amendment process. Altogether, there’s a real emphasis on looking at our plans from a long-range standpoint and providing the right incentives to encourage housing in close proximity to transit—while making sure that the process is fair and systematic, that people can have more faith in environmental impact reports, and that general plan amendments are viewed more holistically moving forward. In a TPR interview two years ago, when you were Planning & Community Development Director of Pasadena, you noted, “Pasadena brings together, more than any place I can think of, a long-range planning vision that guides economic vitality.” Does LA have a generally accepted vision for itself that’s been articulated and shared widely? A big difference between LA and Pasadena is that Pasadena has been much more consistent in updating their plans, and very careful and methodical about public outreach and community engagement. Broad consensus is a very important part of how they update their plans. Pasadena had a groundbreaking plan in the early 1990s, when Rick Cole was mayor, that really changed the way they looked at their city. That’s when they started to target development in the central core of the city, near what was then future transit (now the Metro Gold Line), while preserving and protecting much of the residential neighborhoods. They carefully and consistently updated that plan. 10 years later they did a limited update, bringing certain things up to speed, and more recently—when I was there—we did a very comprehensive update, with a new vision that built upon the previous one. Pasadena’s long-range planning vision was built upon very careful public outreach and community consensus, and was kept up to date over time. Those are things that we can learn from in Los Angeles. Having thoughtful interaction and consensus before adopting our General Plan and community plan updates, and then really keeping them up-to-date, will create faith in the plans, encourage people to follow them, and give them lasting meaning. In recent TPR interviews with LA City Councilmembers José Huizar and David Ryu, both noted the substantive impact the Measure S campaign had on motivating the city to prioritize real city planning. But there was very little focus in that campaign on vision, or the need for a holistic engagement process to ensure that planning reform would be a positive. How do you explain that? When you have an initiative on an issue as complex as city planning can be, you need to discuss it in very broad terms. One thing we can take away from what happened with Measure S is that there is concern about our civic engagement process and how we’re moving forward as a City. And the way we can move forward is to bring people together and build a consensus. It may not have been an explicit topic in the discussion around Measure S, but it is an important part of how we address some of the concerns we heard. The opposition to Measure S appeared to successfully hijack what was expected to be a conversation about the need for reform in the city’s planning process by instead focusing exclusively on the need for greater density to improve housing affordability and homelessness. Did it surprise you that the value of integrating mobility, economic development, public health, and density in planning was neglected? The No on S campaign focused primarily on two issues: housing, including housing affordability and homelessness; and jobs and the economy. A related third issue was that we’re going to need to have change in the city in order to address these issues. The response from voters shows that they understand that there will be change—and that change may be necessary. It’s interesting that about the same percentage of people voted against Measure S as voted for Measure M, the initiative to increase our mobility options. The same is true when it comes to housing, with both the county’s Measure HHH and the city’s Measure H.
Now, it’s my job to figure out how to achieve housing affordability and economic vitality through long-range planning efforts. People in LA are willing to fund these things, and we have to integrate them in a more thoughtful and comprehensive way. What, if any, planning conversations have you had with the Los Angeles Department of Transportation and the entrepreneurs involved in the shared economy? The connection between mobility and land use is very strong. In updating the General Plan, we’re going to have an opportunity to make those more comprehensive links. Since I’ve been here, we’ve forged a close relationship between Planning and Transportation. DOT General Manager Seleta Reynolds and I work together very closely on issues related to growth and mobility. Change is happening. People are coming to Los Angeles regardless of what we do. People are moving here; people are having children; people are living longer. We’re in an era of growth, and the only thing we can do is respond to that by being forward-looking or not. When you talk to neighborhoods and communities about accepting change, of all the things that people talk about, toward the top of the list is usually traffic. Traffic—how to get around in gridlock—is one of people’s biggest concerns. If we’re going to accommodate change and growth, we’re going to have to get around the city in a different way. When we updated our General Plan in Pasadena, we did the Land Use and Mobility Elements at the same time, and I worked very closely with Transportation Director Fred Dock. We realized that while we were developing a forward-looking plan that integrated land use and mobility, we wouldn’t be able to implement these great policies because the antiquated way that we were measuring mobility impacts would work against the plan. So, as we updated the General Plan, we also changed the way we evaluated traffic. We went from Level of Service to Vehicle Miles Traveled. That shift allowed Pasadena to align its development projects with its policies. We’ve started making that shift here in LA. It’s a component of the plan that will help us bring the big-picture vision of where we want to go down to the local level—neighborhood, block, and street. Missing almost totally from the conversation about planning in LA is the need to preserve industrial land to support the growth of good paying, 21st century jobs. How do you integrate economic considerations into planning, when housing interests dictate local and state priorities? Part of the General Plan will be a broad-scale economic analysis. Smaller cities in the region typically do this as part of their General Plan updates. They look at their key employers and industries, and try to project where they’ll be moving in the future. They also look at what may not be existing industries, but areas where they could be competitive to attract job producers. That’s something that I’m interested in incorporating into our citywide General Plan. 10 years ago we didn’t anticipate creative office space or the creative economy. Yet now, that space is generating a lot of our new jobs. We have to be very forward-looking about jobs, and look at what these industries’ needs will be and where they will want to locate. We also have to look at the way how we work is going to change. What are future jobs going to look like? For instance, over the lifetime of our General Plan, many existing jobs are likely going to become automated. The Planning Report this month notes the new AutoParkIt facility located at Helms Bakery on the Los Angeles/Culver City border—an automated facility that condenses the space needed to handle a great many cars efficiently. Codes changes were required to accommodate such a project. How is parking likely to be addressed in LA going forward? In a city as vast as LA, we have many different parking situations. As we go through our re:code LA effort, we’re looking at different standards that are more responsive to individual neighborhoods’ needs. In Downtown Los Angeles, where there are multiple rail lines as well as additional options like bike-share and bus service, we could be looking at a future where we don’t need as much parking, and our standards for Downtown will likely reflect that. But we also have to look at parts of the city that are more suburban in nature. We’re very conscious of the need to provide parking where it’s needed so that we don’t create impacts in other neighborhoods, while not requiring too much parking in areas like Downtown Los Angeles. We’re also looking ahead to automated vehicles. Over the lifespan of our General Plan, it is likely that automated vehicles will become widespread, that car ownership will greatly decline, and that we will have parking spaces we no longer need. We are going to look at how we can repurpose parking spaces in the future, and prioritize the parking spaces we have today for potential conversion to other things. We’ve already begun working on this. We recently updated our guidelines as they relate to parking, to require that above-ground parking structures in, say, Downtown Los Angeles, be able to be converted to building space. We did this because we can see a future in which we won’t need those parking structures. Of course, we’ll still need some parking, and we’ll need to make some major basic decisions as a City about that. Do we want to encourage parking spaces in the public realm or the private realm? This is going to be a significant public-private discussion. The Measure S campaign often suggested that there is baked-in corruption in the city’s out-of-date community plans—i.e., that the approval process practically invites developers to up-zoning parcels via spot zoning, relying on their relationships with elected decision-makers. How will the continual updating of our community plans begin to mitigate that ethical challenge, and add to the integrity of the city’s planning process? When plans are nearly 20 years old, and don’t reflect the current environment or transportation options, it’s easy for developers to make the case that the plans don’t meet our needs and that exceptions are needed. Updated community plans built upon consensus will make that argument much more difficult. I will tell you this: In the five years I was planning director of Pasadena, we had a lot of development. That was five years of economic expansion, and a lot of projects went through the process, including a million square feet for the Parsons project in Old Pasadena. And I don’t recall ever once amending the General Plan, a specific plan, or the zoning code to accommodate a project. That’s because those plans were current. They represented the current thinking. People understood that, and we were able to be very clear and consistent about following the plan. Now, LA is a much bigger place. I realize that we may not be get to that place that Pasadena is in. But we can get to a place where we have far greater faith and certainty in our plans. That certainty is good for everyone—for community members and business owners who are concerned about what may happen near their homes or businesses, and for landowners and developers who can purchase a property with an understanding of what its potential is. Give us a status update on the community plans currently in process. Are they likely to withstand potential challenges? We’ve committed a lot of time to ensuring that both the plans and their environmental impact reports are carefully crafted, and we feel that what we release will meet any legal test that could arise. We recently adopted the community plan for West Adams-Baldwin Hills-Leimert, as well as their implementation ordinances and environmental impact reports. The community plan for San Pedro has been recommended for adoption by the City Planning Commission, and is getting ready to go before City Council. Draft plans and draft environmental impact reports have been released for South Los Angeles and Southeast Los Angeles, and are in circulation right now. We’re expecting to have those go to hearing and be adopted later this year. Hollywood is very close to having a draft community plan and environmental impact report released and circulated for public comment. That should also be completed and through the process by the end of this year. We’ve started the plan updates, and are just getting into the environmental impact reports, for Central City and Central City North—which comprise the Downtown Los Angeles Community Plan—as well as for Boyle Heights. Those plans are going through the process, and will probably be adopted around the end of 2018. 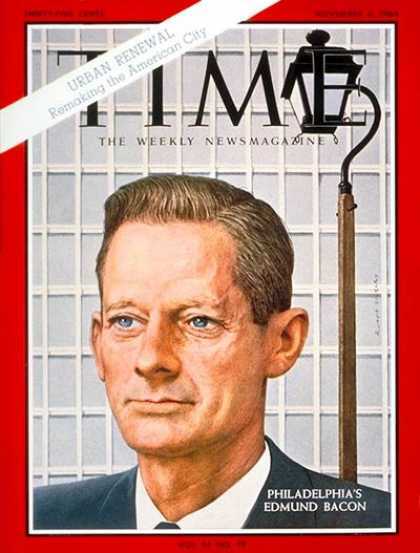 It’s been 50 years since Time Magazine had a city planner on its cover. What would it take for another city planner to be on the cover of any national magazine these days? In other words: What would success look like? For a city planner to receive that kind of recognition, a few things would have to happen. City planning would have to be of great interest to the public—on the forefront of people’s minds in terms of their day-to-day life. That planner would have to be presented with a series of challenges that are reflective not only of their city but also of a good portion of America. And that person would have to put forward a bold vision for his or her city. That vision would need to be, not only powerful for the city that that planner serves, but also something that people throughout the country could look to replicate in their community.